No one has ever dominated the game like Babe Ruth. In 1927, Babe Ruth set the first truly long-term single season home run standard. However, his first Major League home run record was established during the 1919 season when he connected a then unbelievable twenty-nine (29) times with the Boston Red Sox. The 1919 plateau was considered at the time an "unreachable mark" until the following year when the Bambino smashed his own record by going deep fifty-four (54) times—then beat that record just one year later when he went deep fifty-nine (59) times. A few seasons passed and the 1920 record seemed safe until 1927, when the Sultan of Swat blasted sixty (60) long balls (34 before the end of June) in just one-hundred fifty-five (155) games. 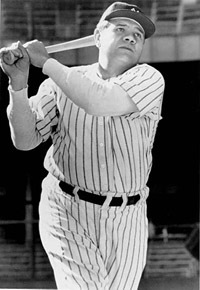 And to prove he never lost his touch in the late innings, “The Bambino” hit his final three career blasts – numbers 712th, 713th, and 714th home runs on the last game of his career on May 30, 1935, when he was playing for the Boston Braves (his third and last team.) 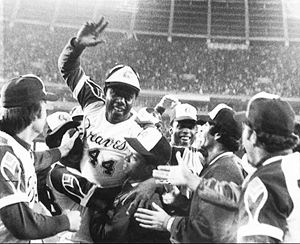 He retired after that game and the Braves finished with a record of 38-115. "I stopped telling people stories about how great he was, because I realized no one believed me." — Hall of Fame pitcher and Ruth teammate Waite Hoyt. Henry Aaron set a standard that may never be equaled by performing at a consistently high level for nearly two decades. He hit 24 or more home runs every year from 1955 through 1973, and is the only player to hit 30 or more home runs in a season at least 15 times. He is one of only four players to have at least 17 seasons with 150 or more hits. Aaron made the All-Star team every year from 1955 until 1975 and won three Rawlings Gold Glove Awards. In 1957 he won the National League Most Valuable Player Award, while that same year, the Braves won the World Series. It was Aaron's one World Series victory during his career as a player. Aaron's consistency helped him to establish a number of important hitting records during his 23-year career. Aaron holds the MLB records for the most career runs batted in (2,297), the most career extra base hits (1,477), and the most career total bases (6,856). He is also in the top five for career hits with 3,771 (3rd) and runs with 2,174 (tied for 4th with Babe Ruth). He also is in second place in at-bats (12,364), and in third place in games (3,298). Not to be left out, Barry Bonds set a new standard on his way to setting a single-season home run record with 73 dingers in 2001, including a stunning 39 before the end of June and 34 more by year’s end. But, just like The Babe, Bonds was not satisfied with breaking the single season home run record. He also set new records for slugging percentage (.863), walks (171), and home runs per at bat (6.52). He broke his personal record with one-hundred thirty-one runs batted in and finished the season with a .328 batting average. His on base percentage (.515), the best in the National League since John McGraw in 1900. 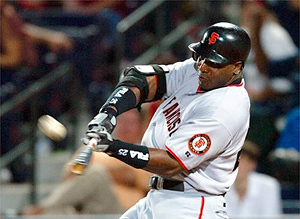 Bonds became the oldest player to lead a league in home runs and also became the oldest player to reach the fifty, sixty, and seventy home run plateaus.